Welcome to the Tiffany Studios Resource Center, developed and maintained by Paul Doros. Paul was the first Curator of Glass for the Chrysler Museum in Norfolk, Virginia and was responsible for producing the catalog of the Museum’s world-famous Tiffany collection. 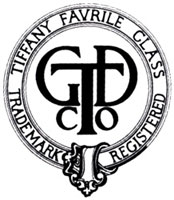 He later served for ten years as an expert in Christie’s Twentieth Century Decorative Arts Department, where he appraised, researched, cataloged and displayed all Tiffany objects. He has written essays for The Magazine Antiques and the Chrysler Museum, spoken at museums and antique shows around the country and is a consultant to Sotheby's and Christie's. Published by The Vendome Press in September 2013, The Art Glass of Louis Comfort Tiffany is the first major work to focus primarily on blown Favrile glass. With critics describing it as "a gem," and "probably the best single book about the artist," it features over 175 color illustrations of rare and unique pieces, most of which have been in private collections for over 40 years. Included is a scholarly look, with archival photos, at the life of Louis Comfort Tiffany, the glass workers he employed and a detailed analysis of the glass itself.